How many times have you heard to eat lots of fruits, vegetables, whole grains, nuts, legumes (beans), and seeds? Study after study finds that eating a diet rich in these foods is linked to all sorts of health benefits. A big reason is that they have lots of fiber - which feeds beneficial microbes in our gut. A recently published review of studies in the prestigious journal Lancet examined studies done over the past 40 years and found numerous health benefits. The researchers found that people consuming high levels of dietary fiber and whole grains have a lower risk of death from heart disease (cardiovascular mortality) and death from any cause. They also have a lower incidence of heart disease, stroke, type 2 diabetes, and colorectal cancer (as compared to those eating less fiber). There was a dose-response effect - in other words, the more fiber eaten daily, the lower the incidence of these diseases and deaths. They also found that a high fiber diet is also linked to lower cholesterol levels, lower weight, and lower blood pressure. This study viewed 25 to 29 grams per day as a high fiber diet, but said the findings suggest that higher levels of fiber would be even more protective. Which means put down that delicious white bread and sugary cereal and start eating whole grain foods! Nowadays the average person eats less than 20 grams of fiber per day, but guidelines say to eat at least 30 grams per day. The researchers pointed out that getting fiber from real food is best. People who eat higher levels of dietary fiber and whole grains have lower rates of non-communicable diseases compared with people who eat lesser amounts, while links for low glycaemic load and low glycaemic index diets are less clear. Observational studies and clinical trials conducted over nearly 40 years reveal the health benefits of eating at least 25g to 29g or more of dietary fiber a day, according to a series of systematic reviews and meta-analyses published in The Lancet. The results suggest a 15-30% decrease in all-cause and cardiovascular related mortality when comparing people who eat the highest amount of fiber to those who eat the least. Eating fiber-rich foods also reduced incidence of coronary heart disease, stroke, type 2 diabetes and colorectal cancer by 16-24%. Per 1,000 participants, the impact translates into 13 fewer deaths and six fewer cases of coronary heart disease. In addition, a meta-analysis of clinical trials suggested that increasing fibeer intakes was associated with lower bodyweight and cholesterol, compared with lower intakes. Most people worldwide consume less than 20 g of dietary fiber per day. In 2015, the UK Scientific Advisory Committee on Nutrition recommended an increase in dietary fiber intake to 30 g per day, but only 9% of UK adults manage to reach this target. In the US, fiber intake among adults averages 15 g a day. 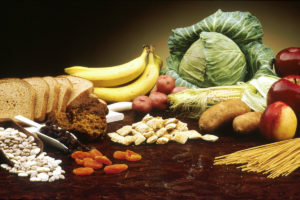 Rich sources of dietary fiber include whole grains, pulses, vegetables and fruit. For every 8g increase of dietary fiber eaten per day, total deaths and incidence of coronary heart disease, type 2 diabetes and colorectal cancer decreased by 5-27%. Protection against stroke, and breast cancer also increased. Consuming 25g to 29g each day was adequate but the data suggest that higher intakes of dietary fibre could provide even greater protection. For every 15 g increase of whole grains eaten per day, total deaths and incidence of coronary heart disease, type 2 diabetes and colorectal cancer decreased by 2-19%. Higher intakes of whole grains were associated with a 13-33% reduction in NCD risk -- translating into 26 fewer deaths per 1,000 people from all-cause mortality and seven fewer cases of coronary heart disease per 1,000 people. The meta-analysis of clinical trials involving whole grains showed a reduction in body weight. Whole grains are high in dietary fiber, which could explain their beneficial effects. "The health benefits of fiber are supported by over 100 years of research into its chemistry, physical properties, physiology and effects on metabolism. Fiber-rich whole foods that require chewing and retain much of their structure in the gut increase satiety and help weight control and can favourably influence lipid and glucose levels. The breakdown of fiber in the large bowel by the resident bacteria has additional wide-ranging effects including protection from colorectal cancer." says Professor Jim Mann. While their study did not show any risks associated with dietary fiber, the authors note that high intakes might have ill-effects for people with low iron or mineral levels, for whom high levels of whole grains can further reduce iron levels. They also note that the study mainly relates to naturally-occurring fiber rich foods rather than synthetic and extracted fiber, such as powders, that can be added to foods. Previous article:What Else Can Lactobacillus Sakei Treat? Next article:Periodontal Disease Link to Alzheimer’s Disease?